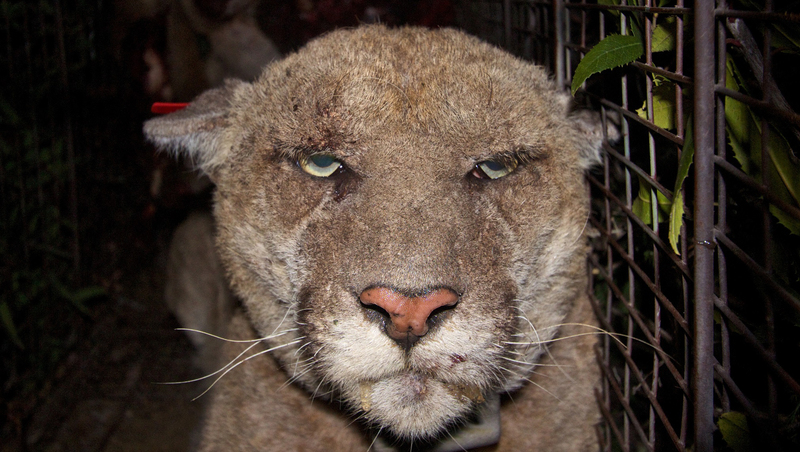 LOS ANGELES - A mountain lion that appeared strong and healthy when it was photographed as it ruled a wilderness park in the middle of Los Angeles has been exposed to rat poison and is suffering from mange, officials said. Scientists noticed the big cat known as P-22 was sickly when they recaptured it last month to replace batteries in its GPS tracking collar, National Park Service spokeswoman Kate Kuykendall said Thursday. The 4-year-old cougar probably ate animals exposed to poison from residential rodent traps, she said. "When people put these bait traps outside their homes or businesses, they may not realize that the poison works its way up the food chain, becoming more lethal as the dose accumulates in larger animals," said Dr. Seth Riley, an urban wildlife expert at Santa Monica Mountains National Recreation Area. Tests revealed the animal had been exposed to anti-coagulant rodenticide, commonly known as rat poison, and was suffering from mange, a parasitic disease of the hair and skin. P-22 was treated and returned to the 4,300-acre Griffith Park, where it continues to successfully hunt its natural prey of mule deer. Biologists said it's unclear whether the cat will fully recover. There's no indication the poisoned cat is a threat to residents, Kuykendall said. P-22's image famously appeared in the December 2013 issue of National Geographic Magazine, with the Hollywood sign as a backdrop. CBS News' Chip Reid did a report on the photographer's quest to document big cats that are disappearing. An image of P22 from that photo essay is at end of this article. The National Park Service has been studying mountains lions in and around the Santa Monica Mountains since 2002 to determine how they survive in an increasingly fragmented and urbanized environment. The connection between exposure to anti-coagulant rodenticide and mange is still not fully understood, researchers said. Mange in wild cats is rare and only two other mountain lions in the 12-year National Park Service study have developed mange - with both ultimately dying of rodenticide poisoning.